We have a lot of teachers and helpers that we want to thank and give Christmas gifts to this year, so rather than breaking the bank and buying something they don’t really need, we are putting on our aprons and baking some delicious food gifts! I love giving the gift of food to my kids’ teachers as it’s something they can be involved in making, but it’s also something the teacher might actually want and enjoy, rather than some of the other … ahem… kinda crappy, kid-made gifts we’ve tried in the past! And the only thing better than gifting someone some home-made treats is to give them the recipe as well so they can make your delicious gift again and again! So I’ve put together a selection of treats we’ve made as gifts in the past, and I’ve made some free printable recipe cards to go with them. 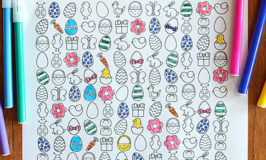 You can download these free printable Christmas recipe cards here. 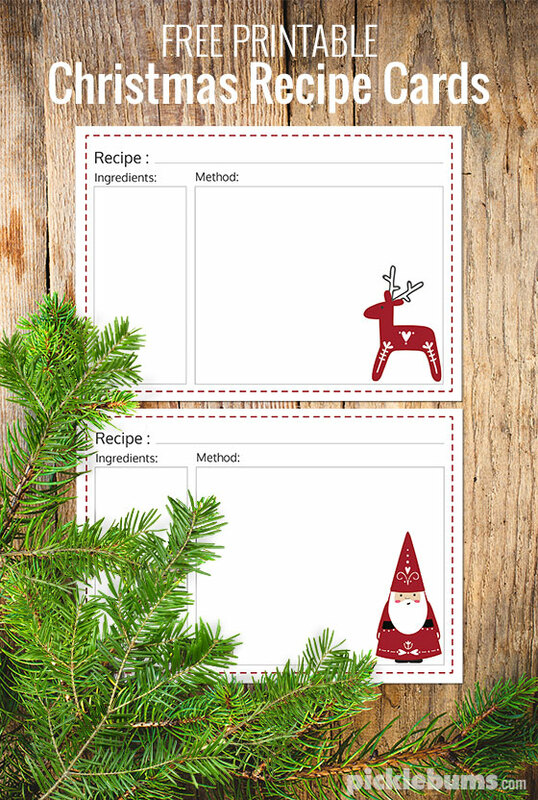 Both of these printable recipe cards print together onto an A4 sized piece of paper. If you are printing on US ‘letter sized’ paper be sure to select ‘fit’ or ‘shrink to fit’ from your printer options. 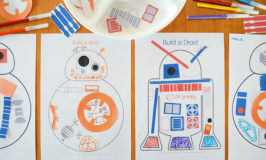 You can edit this pdf docutment using adobe acrobat and type your recipe directly onto the cards before printing, or you can print them as is and hand write the recipes. 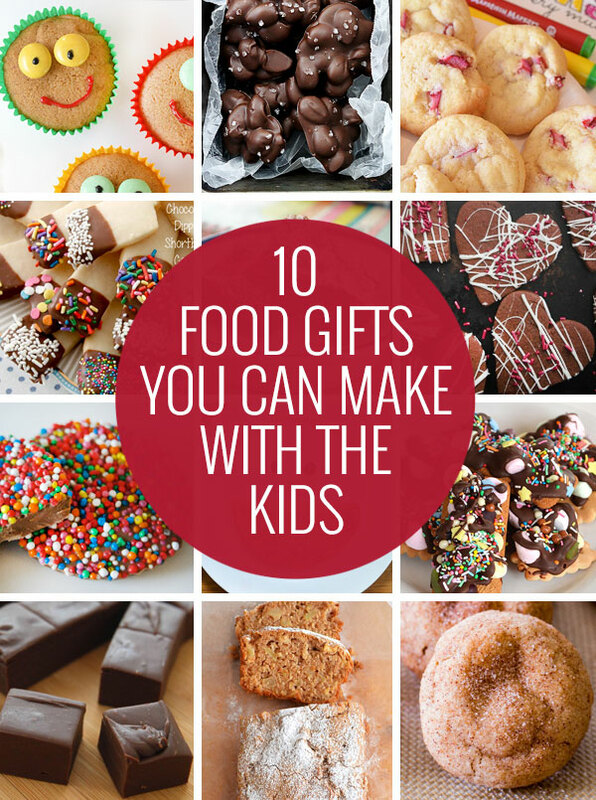 Here are ten of our favourite food gifts to make with your kids. Easier than rolling out cookie dough, these gingerbread cupcakes are just as delicious and fun to decorate. These chocolate almond clusters are super easy to make (we used regular chocolate instead of the almond bark). These apple and rhubarb cookies are a favourite with everyone! You can make these chocolate dipped shortbread cookies from scratch, or you can totally cheat like we did and dip shop bought shortbread! Brownies are a favourite of ours, but hey don’t pack or travel well, but these brownie roll-out cookies do. We made ours star shaped for Christmas. These homemade chocolate freckles are super simple. We made some last year in Christmas shapes using cookie cutters. These no-bake rocky road cookie bars are easy enough for the kids to make then entirely on their own, and you can fancy them up with different toppings for adult gifts. This three minute fudge really does just take three minutes to make! So easy, and you can add all kinds of extras either in the fudge or sprinkled on top before it sets. A sweet bread always looks lovely given in a nice loaf tin. This is our favourite – chunky apple bread. If you are an Australian and have never had a snickerdoodle, then you’d better bake a batch for yourself as well as one for gifts. They are good. Do you give food gifts? What’s your favourite giftable recipe?